"You could tell he was struggling," Woodside junior Alex Salinas stated. Thelma Mooney, a fill-in teacher for one of Bowles' classes, teaches a lesson. “A person only has his [or] her reputation, especially at a relatively small school, at the end of the day,” former Spanish 3 and 4 teacher Brett Bowles told the Paw Print following his resignation from Woodside High School. On January 18, Woodside Principal Diane Burbank stated that “Mr. Bowles has resigned and will not return to campus,” declining to comment on the reason behind his resignation. Prior to Woodside, Bowles taught at Halstrom Academy Private High School in San Diego. According to Gay Buckland-Murray, Department Chair of World Languages at Woodside, Bowles was hired by Woodside administration in August 2018, just before classes started that same month. Still, not all students judged Bowles so harshly. 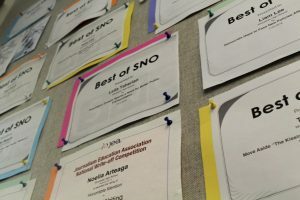 “I respected his effort and how hard he tried to connect to this students,” Markus Sujansky, a sophomore in Bowles’ third-period class, said. 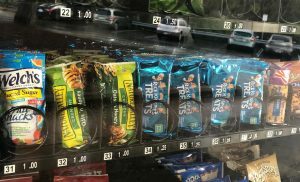 “I think he deserves a break… because it’s his first year [teaching at Woodside],” another student, who wished to remain anonymous, agreed. 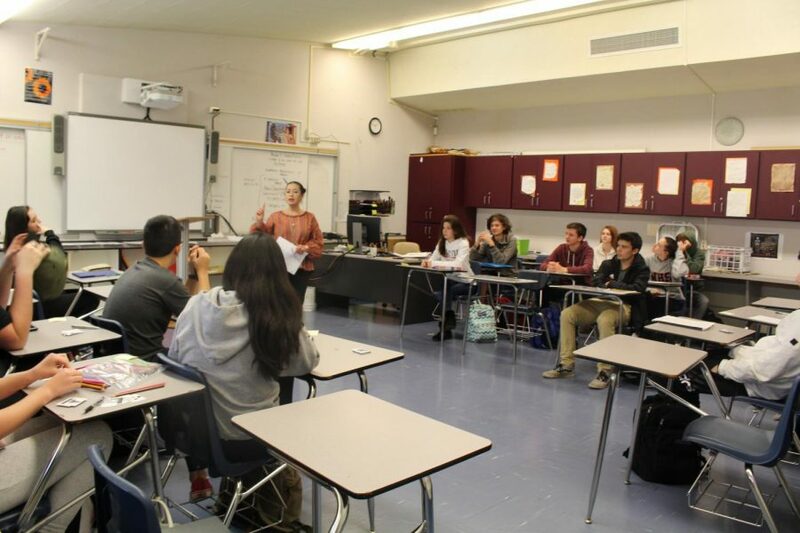 However, some of Bowles’ students, like senior Kathryn Williams, felt that the grace period for his allegedly questionable teaching practices had passed and that his class structure and demeanor hindered learning. Williams explained that although Bowles made understandable mistakes early in the school year, “it got to a point where [students] weren’t learning anything, but… would get tests and quizzes.” Williams eventually dropped the class during first semester. Other students voiced similar complaints about the lack of lesson plans. Junior Colby Peck, who kept a log of every incident with Bowles and was part of a petition that attempted to raise awareness about the incidents occurring in his class, described the first major instance where she believed Bowles crossed the line. “I was shocked, as was the rest of the class,” added Sujansky. Three other students also corroborated that Bowles had made remarks about Tourette syndrome. Aside from Bowles’ suicide jokes, students also accused Bowles of being dismissive towards mental health issues in general. In another incident, sophomore Dylan Pratt felt that Bowles made him the subject of degrading jokes and comments. Pratt, who identifies as Jewish, said the comments were anti-Semitic. Pratt provided the Paw Print with a copy of an email in which he reported Bowles’ comments to Principal Burbank. “After the first ‘joke’ he made, which was that [Jewish people] control the banks, media, and are all misers (it was more of a statement than a joke), I was in a state of shock and didn’t fully process his other remarks,” Pratt wrote. Peck verified that Bowles called Jewish people “misers” and added that Bowles commented, “If I owned a business, I’d hire Jews and pay them less.” Two additional Woodside students have directly corroborated Bowles’ remark. Although Pratt had serious reservations about staying in Bowles’ class, Velschow told him he would be unable to transfer or drop. In spite of the frequent complaints, Principal Burbank declined to comment about whether or not previous disciplinary actions had been taken against Bowles. She did state that overall, Woodside “investigates and then uses progressive discipline” in cases of teacher misconduct. Another common refrain amongst students was Bowles’ policy of sporadically asking students to do push-ups after answering a question incorrectly or in exchange for using the restroom, a tactic which some students felt uncomfortable with. While some students simply refused, others completed five to ten push-ups for the bathroom pass. Video evidence of a student being asked to do pushups to receive a bathroom pass. 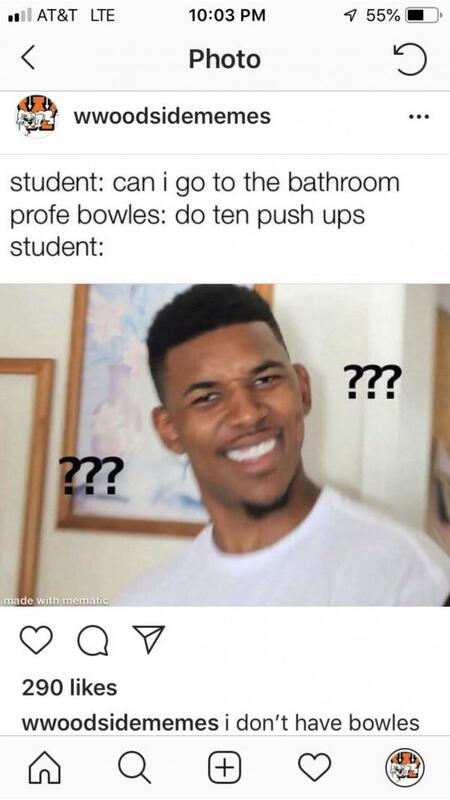 The controversy around the push-ups resurfaced when the popular, public Instagram account, @wwoodsidememes, which has 1,030 followers as of January 25, posted a now-archived meme about students doing push-ups in Bowles’ class. Bowles commented on the post from his personal Instagram account, writing “oh, really now,” and responding with “yeah, really, what?” to students who also commented. @wwoodsidememes, an Instagram account that makes jokes for Woodside students, posted a meme about Bowles’ pushup policy. Several students commented publicly on @wwoodsidememes’s post. 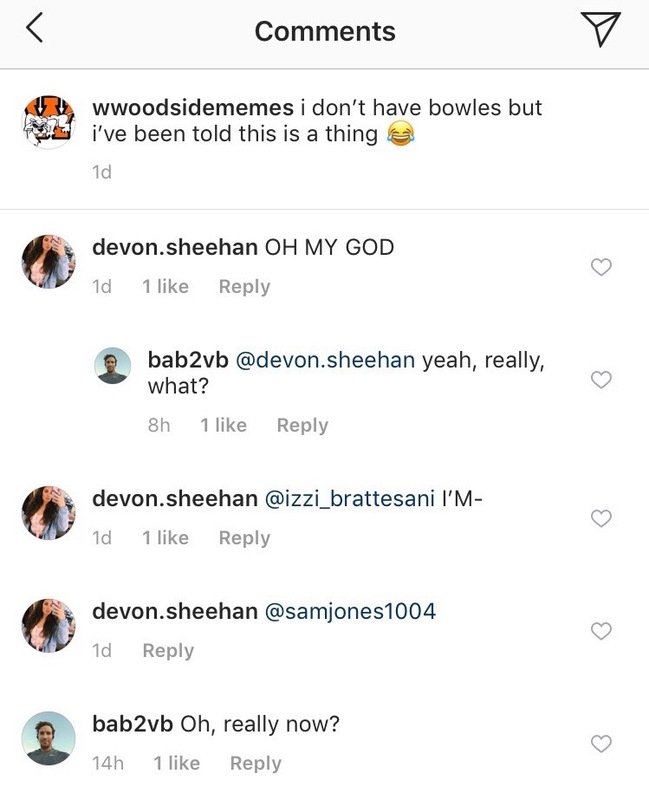 The @wwoodsidememes account administrators, who often create original, light-hearted memes about teachers based on student requests, told the Paw Print that a meme about Bowles had been “highly requested by students.” Even after its deletion, there remained a point of controversy, with one student direct messaging the account admin to say they had been called into a meeting with Velschow because of their comment on the post. That student, who remains anonymous, explained to the Paw Print that in his conversation with Velschow he was “asked to delete the comment.” The student complied. Students have varying opinions about the incidents that unfolded. Some, like Salinas, expressed sympathy for Bowles. Since Bowles’ resignation, Spanish teacher Amy Hanson has been working with other teachers to make sure Bowles’ classes continue to learn and benefit from their elective choice. Hanson volunteered to teach his third and sixth-period classes until the administration reached a permanent solution. In addition to Hanson and Dorsey, other certified Spanish teachers, including Thelma Mooney, are currently teaching Bowles’ six classes. Meanwhile, both the administration and staff are working together to find a long-term solution to Bowles’ resignation. Principal Burbank told the Paw Print that she hopes the school “will have patience” as they look for a new teacher. Meanwhile, Bowles has mixed feelings towards Woodside students. Despite the controversy surrounding Bowles and his resignation, staff members remain focused on the well-being of students and the collaborative nature amongst the staff. All you need to know about this teacher is to read his comments in this article. Even after he resigns, he takes zero accountability and bashes the students. Deny, deny, deny. Woodside can do far better. Good riddance. This article is truly a class act on the Paw Print’s part! Impeccable work! Great job avoiding bias and getting both sides of the story. You two are truly budding journalists! My opinion of the Woodside journalism program has improved. He shouldn’t have been fired for triggering a couple of snowflakes with a few jokes. I was in his class and never felt uncomfortable at all and quite frankly, I enjoyed his class and the way he handled things. This article is a masterpiece! You all make me proud to have been part of the Paw Print. Thank you Stefan!! We miss you. Hope you’re enjoying Georgetown!